A summary of CCEF booklet by David Powlison. What do you grab for that you hope will protect, soothe, and comfort? Whatever it is – shopping, overeating, drinking, drugs – promises relief, but never delivers. Instead, you are left feeing empty, anxious, guilty, and wanting more. Jesus redeemed us to understand pleasure as very, very good. What gives you pure and simple pleasure? What helps you to lay your cares down and get a fresh perspective on life? What enables you to step back into the business and hardship of life with a new joy? Innocent pleasures don’t pretent to save you or protect you. They are not the giver of every good and perfect gifts; they are just gifts you enjoy. They are innocent because they don’t pretend to be anything more. What makes a pleasure go bad? What are the guilty pleasures in your life? What is on your list of potentially innocent pleasures that go bad? So how can you tell when a pleasure crosses the line from innocent to guilty? 1. The pleasure is plain wrong. 2. The pleasure captivates and captures you. 3. The pleasure is hidden. 4. The pleasure steals you away from the good. 5. The pleasure doesn’t deliver. Stained and guilty pleasures often arise as a restless escape from troubles. What difficulties tempt you towards the guilty pleasures? When you are bored and lonely, with nothing to do, you ____________. When you are stressed, frustrated, and worn out, you _____________. When you are hurt, betrayed, and treated unfairly, you ____________. Scripture shows us that God runs his universe in ways that are counterintuitive. That counterintuitive door is to face your suffering, to take hold of it instead of seeking to escape it. Honestly say to God how you feel and trust in his presence with you. We bring to God both our pain and our pleasure. Walking into suffering with eyes wide open, and not running after escapist pleasures, opens the door to knowing the love of God. In the hands of a loving God, sorrow and suffering become doorways into the greatest and most indestructible joys. Far from the belief that Christians have to give up everything they enjoy to do dreary things, the truth is that your pleasure mechanism is rearranged. You are free to feel all sorts of exquisite joys you never imagined. It takes less and less effort. In the stained pleasure cycle, the addictive cycle, it takes more and more to push the lever of joy. In your experience, what has proved truly restful? What has left you feeling nourished afterwards? What pleasures leave no residue, no guilt, exhaustion, or unrest? What is the invigorating opposite of your workday life? Honest work and honest rest are complementary goods. The Bible’s view of rest is restful and refreshing. God made us for rest and pleasure, and he wired us so that stained pleasures will leave a stain, while the innocent pleasures bring pure pleasure. 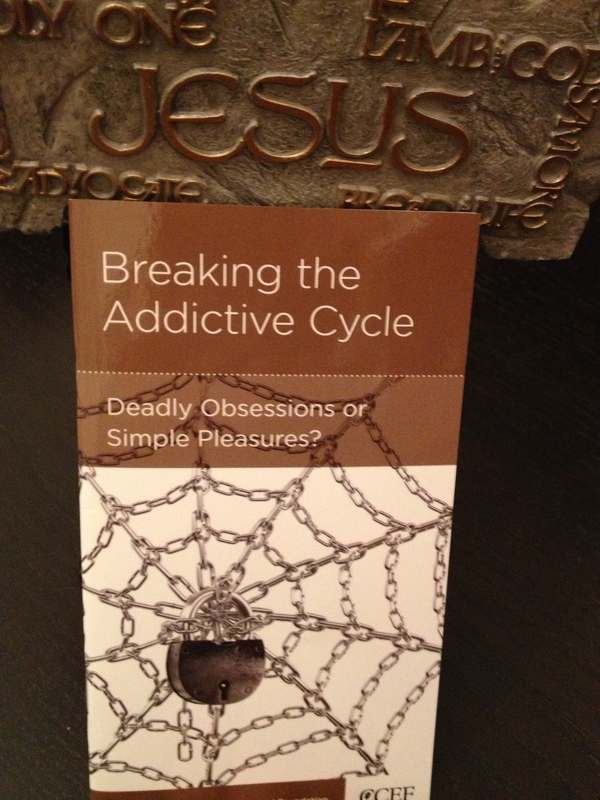 Take a permanent fast with guilty and immoral obsessions like sexual immorality, drug and alcohol abuse. An intentional fast from your recreation habits works against your obsessive pleasure-seeking and teaches you fascinating things about yourself and God. What will give you the most pleasure in life? What pleasure will not dim through all the changes of your life? Your inability to deal with your obsession is God’s mercy to you, because it forces you to go to God for the help you need. As you go to God, use his Word to guide your relationship (Psalm 23 or John 10). One step behind the supreme pleasure of loving God is the pleasure of true friendship – loving others. The goal is always the simple, joyous relationship with others – the mutual affection and give-and-take. God calls you to widen the circle of your friendships, and to avoid making a god out of those who bring you the greatest pleasure. The Father’s love, the Son’s self-sacrifice, the Spirit’s intimate power are freely offered gifts. God is committed to helping you turn away from obsession and towards the true pleasure of loving God and others.